Acts intensely and simultaneously on wrinkles, puffiness and dark circles that make the eyes look tired and distorted. Fresh, smooth texture restructuring of the eye contour. Anti-dark circle, anti-puffy and anti-ageing. As an allergy-sufferer I often struggle to get rid of (or even cover up) the dark circles under my eyes. Although I don’t have any puffiness, it is seldom that my under-eyes are completely circle-free. so I almost always opt for an eye cream that treats these problem areas. 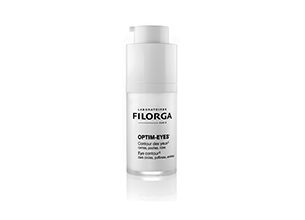 I like this eye cream by Filorga, because I have seen some improvement after only a few weeks. Though the dark rings are nowhere near gone, they are definitely lighter and less noticeable, and some days I even went concealer-free! The area around my eyes seems brighter too. I love the packaging, though it took me a while to get used to the pump-action bottle. Somehow, I couldn’t pump just the right amount, I always ended up with much more product than I needed. I quickly got the hang of it, though. The texture is light and almost gel-like, yet it feels rich and nourishing when applied to the skin.